Rudyard, which sits on the shores of Rudyard Lake, is a small village west of Leek in Staffordshire. Rudyard Lake was built in 1797 as a reservoir for the Trent and Mersey Canal Company to provide water for the Caldon Canal. The lake is about 2½ miles long and a quarter of a mile wide. The North Staffordshire Railway, which ran alongside the eastern edge of the lake, was constructed in 1845. The lake soon became a very popular destination with visitors and day trippers wanting to take advantage of the easy access of the new railway. Visitors included John Lockwood Kipling and Alice Macdonald, who first met there and fell in love with the place so much during their courtship, that they decided to name their son, poet Rudyard Kipling, after it. The lake, home to Rudyard Lake Sailing Club and North Staffordshire Rowing Club, is used for many water activities such as boating, canoeing, fishing and also for boat trips aboard Honey, steam train trips and walks. 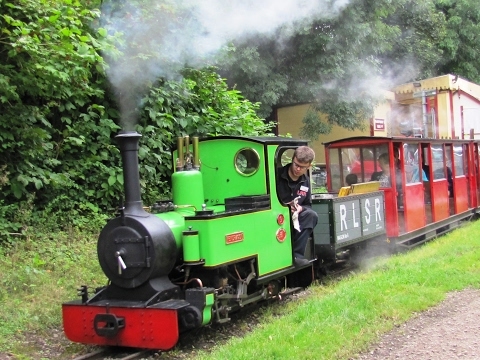 The Rudyard Lake Steam Railway runs narrow gauge steam trains that operate on the east side of the lake on many days throughout the year. The railway is operated by a group of dedicated volunteers who have plans to improve and enhance their services and facilities. The return journey covers 3 idyllic miles with stops at the Dam, to access the lake, and Hunthouse Wood. The station has a free car park and cafe facilities to enjoy before riding the train. There are also special events throughout the year. The western shore is part of the Staffordshire Way and it is possible to walk round the lake or walk part way and start or finish by steam train. There is also a visitor centre, toilets, cafe, picnic areas and an activity centre to make Rudyard Lake a superb day out. The BBC’s motoring show Top Gear held a challenge at the lake in 2006 to see which presenter had designed the best amphibious car. Rudyard Kipling who was born December 30th 1865 in Bombay India and died January 18th 1936 in London was an English journalist, short story writer, poet and novelist. His works of fiction include “The Jungle Book”, “Kim” and “Man Who Would Be King”. His poems include “Mandalay”, “Gunga Din”, “The Gods of the Copybook Headings”, “The White Man’s Burden” and “If”. His children’s books are classics of children’s literature. After living in India until the age of 5 he along with his sister were sent to England to stay with a foster family in Southsea. He returned to India when he was 16 to work as a journalist and editor for a Gazette in Lahore. In 1892 he married and moved to Vermont where he published the two Jungle Books and began work on Kim. He returned to England with his family in 1896 and published his novel Captains Courageous. He then visited South Africa during the Boer War editing a newspaper and writing the Just-So Stories. Kim, Kipling’s most successful novel, and last, appeared in 1901. Kipling and his family moved to Sussex in 1902 and devoted the rest of his life to writing poetry and short stories including his most famous poem “If”. The Staffordshire Way is a 92 mile long distance footpath spanning the length of the county. It was created by Staffordshire County Council using existing rights of way and permissive paths and links with the Cheshire Grit stone Trail, the Heart of England Way and the North Worcestershire Path. Starting at Mow Cop Castle it passes through several interesting towns and villages and much of Staffordshire’s finest scenery before ending at the dramatic sandstone ridge of Kinver Edge. The route never far away from attractions and places to stay makes it an ideal path to walk in separate stages as well as those wishing to walk the whole route it in a week or so. Starting from the entrance of Hotel Rudyard we head forward along the lane to the road junction, turn left then pick up the public footpath on the right opposite the garage. We follow the path with the stream on our right. When we come to a gate we go through and turn left and go up the steps to join the dismantled railway line. We now turn left and continue on the railway line, which becomes the Staffordshire Moorlands Walks, for about 2.5 miles passing the miniature railway station on the right and the dam with views of the lake on the left. At the end of the lake we go under the bridge and turn left. We follow the track over a little bridge and continue as it bears left then right. When the track starts to rise we turn left at the signpost, Staffordshire Way, into the trees. We come out into the open and keep heading along the path passing a large building on our right and into the woodland. We pass the moored boats and sailing club then continue to go round a right hand bend. Very soon we take the path on the left then go through some more trees. At the caravan park we bear right slightly uphill then at the fork we bear left to follow a narrow path. We come out at the road and at the first house we turn left at the footpath sign and walk between the fences down to the lake side. We turn right passing the visitors centre, cafe and public toilets to the lake car park. We now turn right to go out of the entrance then left along the lane back to our car. This is an easy walk, ideal for all the family, on distinct gravel tracks and short distances of tarmac road. Elevation: approx lowest point 149.50m (490.49ft) approx highest point 200.20m (656.82ft) approx ascent 181.40m (595.14ft). Approx 6 miles allow 2½ – 3 hours using OS Explorer Map OL24, The Peak District White Peak area. This walk is done anti-clockwise. Start point: The entrance to Hotel Rudyard. Rudyard is north-west of Leek in Staffordshire. From Buxton take the A53 into Leek then take the A523. At Poolend take the left turn opposite a farm onto the B5331. Continue on this road and after crossing a bridge over the canal turn right then bear off right down the little road to the Hotel Rudyard and the Rudyard Lake Visitors Centre car park. From Newcastle-under-Lyme take the A53 to Leek. In Leek take the A523 then as above. Parking: Rudyard Lake Visitors Centre pay and display car park, free road side parking on road near Hotel Rudyard and free parking at the Miniature Steam Railway Station car park. There are public toilets at Rudyard Lake Visitors Centre. The toilets at the Miniature Railway Station are for customers only. For refreshments there is the Hotel Rudyard, a cafe at Rudyard Lake Visitors Centre and a cafe at the Miniature Steam Railway Station.